Motor comes with a 2 year guarantee. During the 12 month guarantee period, we will pay for return postage costs in the case of a warranty claim. Save $$$ hundreds on this genuine bargain that won't be found anywhere else in Australia. The Magic Cooker is such a versatile cooking appliance, it is almost the only appliance you will need in the kitchen! Imagine having 8 kitchen appliances in one single unit? Well you've got it! 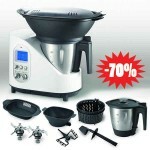 The Magic cooker can steam, chop, cook, mix, blends, fried, crushes ice and even knead dough. The Magic Cooker is the fast and easy way to prepare and cook meals for your whole family, all in one single appliance. 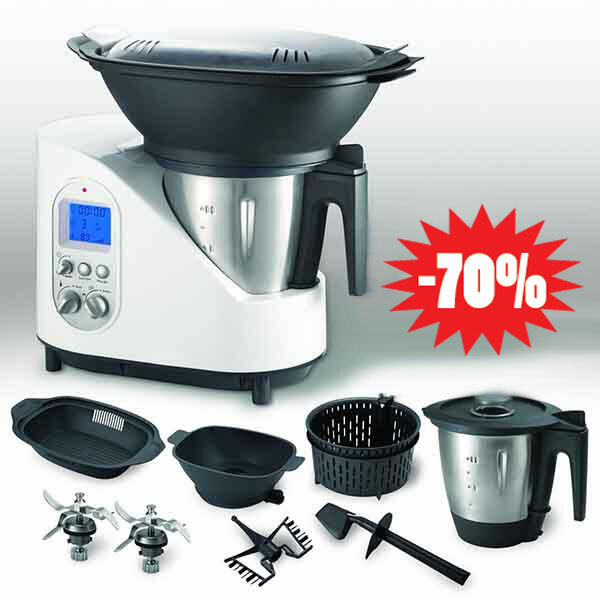 Comes complete with: 1 motor base housing, 1 stainless steel 2 litre bowl, 1 stainless steel chopping blade, 1 stainless steel stirring blade, 1 steaming set accessory, 1 basket, 1 plastic spatula and 1 plastic stirring attachment. Variable 10 speed rotary control. LCD display with blue background. 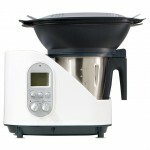 The Magic Cooker is a fantastic machine and Just Electrical offer a great warranty. Although the wait was around 15 business days for delivery it was worth it.